Amid rising concerns that dietary habits are leading to a global pandemic of obesity, the debate has until now largely ignored a critical question – how can manufacturers of bread and processed foods remain profitable while making the products healthier? The government of Singapore – Asia’s second most obese nation after Malaysia, according to a 2014 report published by British Medical Journal The Lancet – recently declared war on diabetes by urging the city state of 5.5 million people to eat healthier food and to adopt healthier lifestyles. 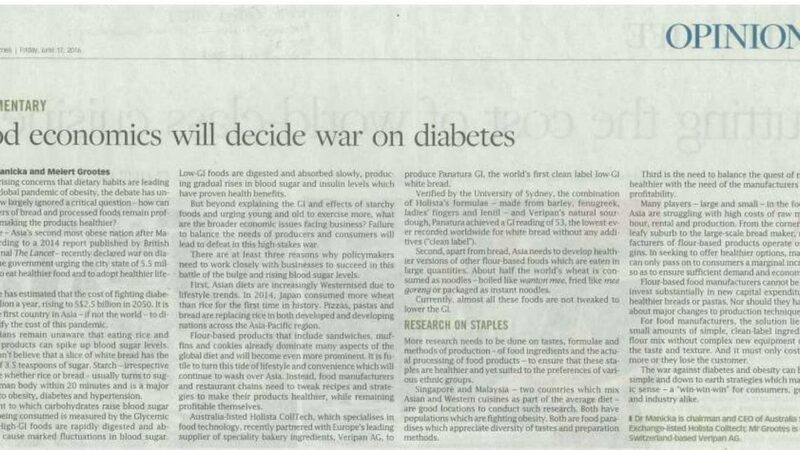 Singapore has estimated that the cost of fighting diabetes at S$1.0 billion a year, rising to S$2.5 billion in 2050. It is probably the first country in Asia – if not the world – to directly quantify the cost of this pandemic. Many Asians remain unaware that eating rice and flour-based products can spike up blood sugar levels. Many still don’t believe that a slice of white bread has the equivalent of 3.5 teaspoons of sugar. Starch – irrespective of the source whether rice or bread – usually turns to sugar in the human body within 20 minutes and is a major contributor to obesity, diabetes and hypertension. The extent to which carbohydrates raise blood sugar levels after being consumed is measured by the Glycemic Index (GI). High-GI foods are rapidly digested and absorbed, and cause marked fluctuations in blood sugar. Low-GI foods are digested and absorbed slowly, producing gradual rises in blood sugar and insulin levels which have proven health benefits. But beyond explaining the GI and effects of starchy foods and urging young and old to exercise more, what are the broader economic issues facing business? Failure to balance the needs of producers and consumers will lead to defeat in this high-stakes war. There are at least three reasons why policy makers need to work closely with businesses to succeed in this battle of the bulge and rising blood sugar levels. First, Asian diets are increasingly Westernised due to lifestyle trends. In 2014, Japan consumed more wheat than rice for the first time in history. Pizzas, pastas and bread are replacing rice in both developed and developing nations across the Asia Pacific region. Flour-based products that include sandwiches, muffins and cookies already dominate many aspects of the global diet and will become even more prominent. It is futile to turn this tide of lifestyle and convenience which will continue to wash over much of Asia. Instead, food manufacturers and restaurant chains need to tweak recipes and strategies to make their products healthier, while remaining profitable themselves. Australia-listed Holista CollTech, which specialises in food technology, recently partnered with Europe’s leading supplier of speciality bakery ingredients, Veripan AG, to produce PANATURA GI, the world’s first clean-label low-GI white bread. Verified by the University of Sydney, the combination of Holista’s formulae – made from barley, fenugreek, ladies’ fingers and lentil – and Veripan’s natural sourdough PANATURA achieved a GI reading of 53, the lowest-ever recorded worldwide for white bread without any additives (“clean label”). Second, apart from bread, Asia needs to develop healthier versions of other flour-based foods which are eaten in large quantities. About half the world’s wheat is consumed as noodles – fried like mee goreng, boiled like la mian or packaged to go as instant noodles. Currently, almost all these foods are not tweaked to lower the GI. More research needs to be done on tastes, formulae, and methods of production – of food ingredients and the actual processing of food products – to ensure that these staples are healthier and yet suited to the preferences of various ethnic groups. Singapore and Malaysia – two countries which mix Asian and Western cuisines as part of the average diet – are good locations to conduct such research. Both have populations which are fighting obesity. Both are food paradises which appreciate diversity of tastes and preparation methods. Third is the need to balance the quest of making food healthier with the need of the manufacturers to maintain profitability. Many players – large and small – in the food sector in Asia are struggling with high costs of raw materials, labour, rental and production. From the corner bakery in a leafy suburb to the large scale bread maker, most manufacturers of flour-based products operate on thin margins. In seeking to offer healthier options, manufacturers can only pass on to consumers a marginal increase in cost so as to ensure sufficient demand and economies of scale. Flour-based food manufacturers cannot be expected to invest substantially in new capital expenditure to make healthier breads or pastas. Nor should they have to worry about major changes to production techniques. For food manufacturers, the solution lies in adding small amounts to simple, clean label ingredients to the flour mix without complex new equipment or changing the taste and texture. And it must only cost marginally more or they lose the customer. The war against diabetes and obesity can be won with simple and down to earth strategies which make economic sense – a “win-win-win” for consumers, governments and industry alike. Dr. Manicka is chairman and CEO of Australia Securities Exchange-listed Holista Colltech; Mr. Grootes is CEO of Switzerland-based VERIPAN AG.